QM 3/c Hubert L. Gilbreth, son of Mr. and Mrs. H. M. Gilbreth, attended Frederick High School. 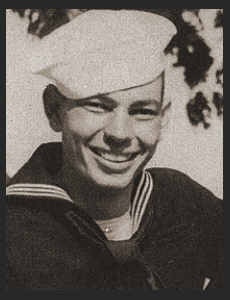 Entered Navy in July, 1943, trained in Milligan College, Tenn., Univ. of S. Carolina, Great Lakes, Ill., and Gulfport, Miss. ; served in the Hawiians, Guam, the Philippines and Japan, served on the U.S. S. Tryon. Awarded Asiatic Pacific Ribbon, Victory Ribbon, Am. Defense Ribbon.